Skype for Business is actively used by millions of people at work around the globe. In Volvo’s 90 Series cars people will be able to view their upcoming meetings and participant details, and join meetings with one click via the large center display. 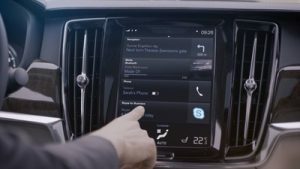 Volvo’s partnership with Microsoft also includes the exploration of using Cortana, Microsoft’s intelligent personal assistant, with the express intention of adding seamless voice recognition and contextual insights to support peoples’ daily lives by actively predicting their needs.